When HLF first came out, it was a garbage card all the way until Kung fu dudes dropped. That was when the card began seeing any play near me. There also was no such thing as "negative play experience" either, even after HLF saw more play. You won, you lost, you got over it. HLF became a card to consider during build, made people a little more gun shy when going up against certain deck types, but it didn't deserve the effective "ban and replace" errata. Finding out that the reason for it was due to a handful of players not liking it was especially surprising. Guess we had more sand here in my area and weren't scared of lose to win strategies. Let's face facts, here. Errata only really matters for official tournament play. You can take it or leave it in casual settings. Any errata that changes a card's basic function such that it eliminates deck builds from tournaments isn't errata. It's ban and replace for tournament play. Furthermore, any errata that is motivated by dislike of a strategy and which effectively eliminates a deck type using that strategy is not errata. It is manipulation of the tournament play field, an abuse of authority, and something I consider to be on par with corruption of officials. Not liking a card is not enough to merit errata that effectively eliminates deck builds from tourneys. There's no such thing as "negative play experience" during tourneys. There's winning and losing. That's it. And lose to win decks, whether you like them or not, are viable tourney deck strategies in a game that takes place in the Weird West. Now, if you want to argue that HLF is really strong now that Kung Fu dudes are out in the wild--an unforeseen game mechanic when HLF was originally designed--I will grant you that as valid and deserving of some errata to adjust for the new mechanic. Giving HLF Headline, which restricts how many can be played in a shootout and gives​ the opponent ample opportunity to counter it, and keeping the rest as printed sounds like great errata that doesn't eliminate decks from tourneys. I agree for the most part with your analysis of the reactionary errata to both Hot Lead Flyin' (HLF) and Paralysis Mark (PM). But I also agree with a general consensus that Negative Play Experiences (NPEs) both 1) exist and 2) are bad for the game. This begs the question: What is a NPE? I can attempt to offer a three-fold answer to this question. The way I see it, there is a fine line between losing by being out-played and/or out-lucked, and a full-on NPE. To me, without doing all the complicated maths, the best way to informally measure this would be to look at the ratio of cards like HLF and PM drawn in a single game to the probable win percentage of the person who drew them, all other things (deck build, pilot skill, sheer luck) being treated as equal. And, what pushed those cards for me into NPE-territory is the strong correlation between drawing those cards and winning matches, having a minimizing effect on all the other factors in a given match-up (build, skill, luck). Secondly, these two cards, by virtue of the "shadow" they cast over the board, violated a fundamental design axiom of Doomtown Reloaded as it differentiated itself from Classic: Incentivizing Interactivity through the Townsquare. Each card did this in it's own way. Decks that both packed 4x HLF and camped the Townsquare created a damned-if-you-do-damned-if-you-don't situation where with minimal build-up, if you were playing against a HLF-camper, your options were to either charge in and "win" the shootout (and likely lose your whole posse), play "around" the Townsquare (with movement and positioning heavily leveraged against you), or to fight fire with fire (also play a HLF-camper). In a word, this deck dictated game state, and made it so if you wanted to have tools to fight against it, you had to build and play completely around a single archetype in hopes for a modicum of a chance. With PM, a similar situation occurred. Finally, there is the ability of the game to attract new players - more players means the game deepens and it's run improves in longevity - and both deck archetypes were, simply put, unfun for new people to play against. The following questions might come up: "If this game claims to use poker to resolve conflict, how come one card completely bypasses this aspect of the game?" and "If this game claims an intense chess match to close out, how come one card completely bypasses this aspect of the game?" - something a more seasoned player may be able to play around, but certainly a considerable obstacle as concerns growing the general player base. Suffice it to say, there is a difference between bending the fundamental structures of the game, and breaking them altogether. One tool the developers used to gauge how powerful cards were was the turnout in tournaments: If the decks in the top spots have a spread of diverse archetypes, the game is doing good - If the decks in the top spot consist of only one or two archetypes, something needs to be done. Was it an overreaction? Yes (in my opinion). Was it necessary to do something? Yes as well. So. Here we are. I for one am excited that in the changing of hands of the game's development that these issues will be looked at again from a fresh perspective. And you gotta hand it to a team of developers who reach out to the INTERNET for feedback. Even if I will also say that the Doomtown community is a pretty solid and respectful bunch, all in all. Apologies for another gravediggin' (guess that's inevitable when one is late to the party). It's an overkill way of dealing with overkill, but the flavor is there. Hot Lead Flyin' -> Stray Lead; this might look a lot like bringing snakes to deal with a rabbit overpopulation, but, just for fun, consider this. "Stray Lead: Reaction: Play when hand ranks have been changed so that the previous loser is now outranking the previous winner by 2 or more. The new winner of this shoutout round has killed an innocent person - until end of game, they are always considered to have one fewer control points than their actual total"
"Stray Lead: Headline(? ): Play when the first casualties are taken. 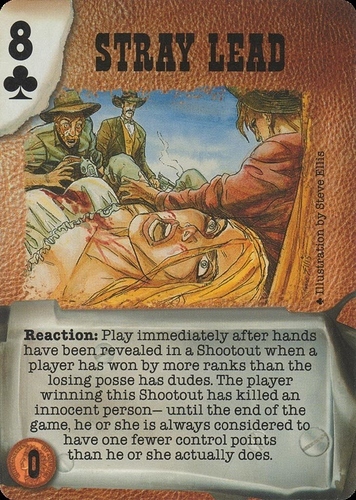 If the hand difference is greater than the number of casualties taken by 2 or more, the winner of this Shoutout has killed an innocent person - until end of game, they are always considered to have one fewer control points than their actual total"
the second version might encourage the "losing is winning", baiting, and be possibly more aggravating than HLF, but can't be triggered before the first round is almost over (matters if it's a Headline). I always liked the flavour for that card, although I'd perhaps switch things towards giving the other player a CP to encourage resolution to the game. Might have issues with floating control points (better for balance for them to be on a dude) but this could work. Doomtown is good at combining mechanics with flavour and this is a good example. "Grave diggin'" seems a genre appropriate name for thread necromancy, but I don't think it's a big issue here. There are a few new/returning players and there are lots of helpful/fun old articles for people to dig out and provide their views on. Stray Lead: Headline(? ): Play when the first casualties are taken. If the hand difference is greater than the number of casualties taken by 2 or more, the winner of this Shoutout round has killed an innocent person - choose a dude with at least 1 influence outside of this Shootout. That dude gains a permanent control point"